If you have followed me on instagram for any amount of time, you probably know a few things about me. First, that I have a 6 year old and 15 month old twins. 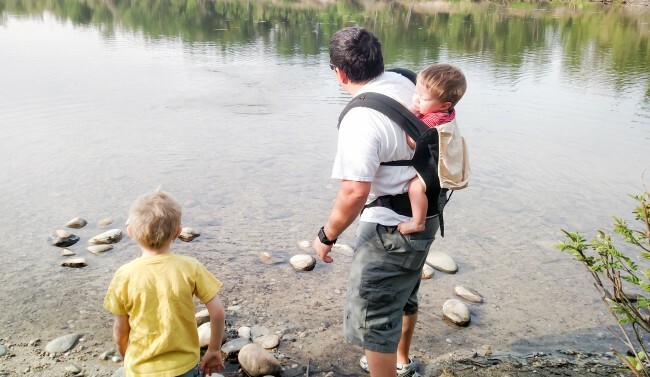 Second, that we like to get outdoors and often times that involves baby wearing. Finally, that we love to travel. 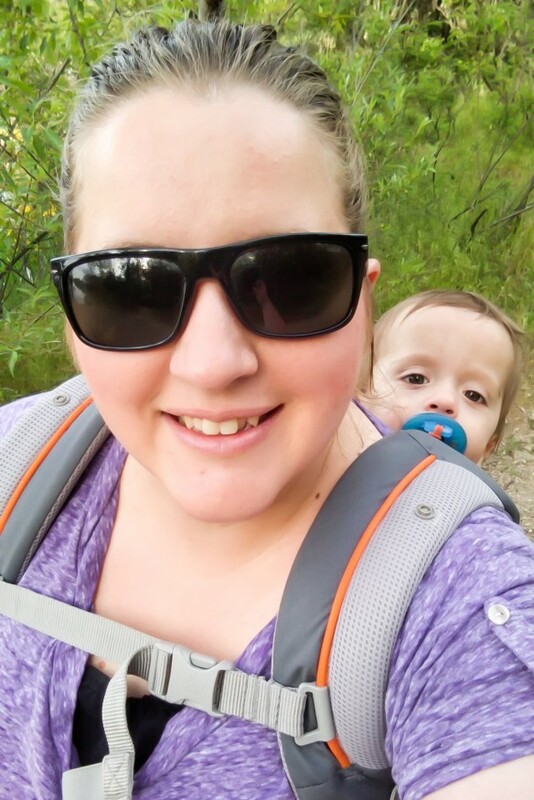 Baby wearing (or using baby carriers) is a great way to take the little ones along on all your adventures, and even to let you keep them close at home while still allowing you to be active and use your hands. There are so many great reasons for baby wearing (or toddler wearing) but today I want to compare baby carriers for your vacation and let you know our favorites and what ones might work for you. 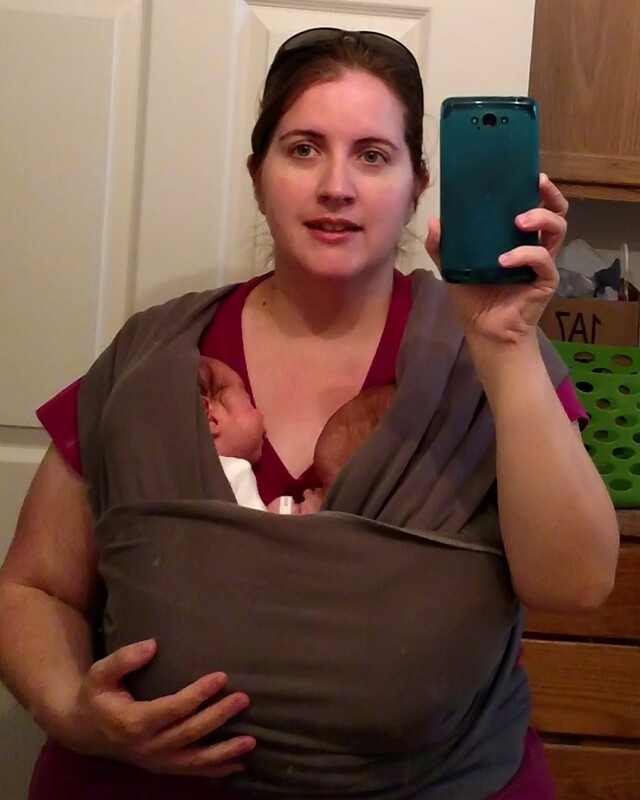 More specifically, I want to compare our 3 favorite types of carriers, a Ring Sling, a SSC (soft-structured carrier) and a structured backpack carrier. I am going to let you know why I love each of these, and why we have every single one of these. I am also going to break down which ones will be best for your vacation, depending on where you are going. Disclosure: This post contains affiliate links to purchase the different carriers I will discuss. Purchasing from my affiliate links gives you the same great deal you would get anyways, but it also helps me earn a little money. I wore the Goof a lot when he was an itty bitty baby, but he was full on running by 9 months, and was not fond of being worn much after a year. After that, I mostly only wore him on vacation. So, I would say then I dabbled in baby wearing. With twins however, I found that baby wearing would become a way of life. Don’t get me wrong, I do use a stroller plenty as well, but there are some situations where wearing one (or both) babies is much easier than using a stroller. There are tons of different carriers out there. I personally have used wraps (both stretchy and woven), SSC (soft structered carrier- Ergos, Tulas, Bobas, etc) and structured back pack carriers (Kelty, Deuter, etc). First, let me briefly break down the different carriers. Then we will talk about which carrier is best for your vacation. WRAPS– I am lumping both stretchy and woven wraps together. 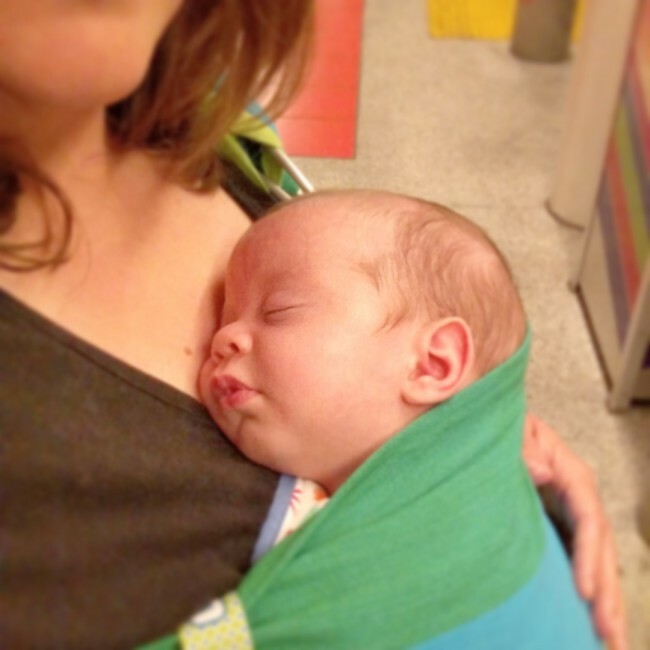 Wraps, in a nutshell, are a long piece of fabric that you wrap around yourself, and the baby, to wear them. Stretchy wraps are the ones commonly sold in stores (Moby) but woven wraps are sturdier and can hold children for years, where as stretchy wraps are only really good for babies. I am not a huge wrap person because I get hot very easily as do 2 out of 3 of my children. I wrapped the Goof maybe 3-4 times, but the babies I used a wrap from 3 weeks (shortly after they came home from the NICU) until 2 months or so when I could no longer tandem wear them in a wrap without them fussing. Because I am not very experienced with wraps, I am not going to include them in the travel section, but I wanted to mention them here. RING SLINGS– A ring sling is my absolute favorite carrier for newborns, but I have learned it is great for my 15 month olds as well. A ring sling (put simply) is a long piece of fabric that is sewn around solid rings on one end and then you run the other end through the rings to create a sling. Ring slings are easy to nurse in, can hold itty bitty babies (on your chest) or older babies and even toddlers on your hip. They are easy to throw in a diaper bag, swim bag, or even just keep in a car. I love them now (with 15 month olds) for their portability and ease of use. It is important you be sure to purchase ring slings that are good quality. Your ring should be solid (not welded together). I LOVE my Maya Wrap Ring Sling that I got after the twins were born. They are super comfy, and even have a pocket. With the Goof I had a Sleeping Baby Productions Ring Sling. 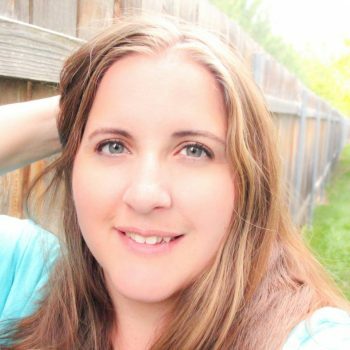 She is a work-from-home mom business, and while her quality is great, and her price is good, ordering from her can be tricky. When she is super busy she opens up slots (and they fill quickly) to place orders. SSCs– SSCs or Soft-Structured Carriers are probably my favorite carriers of all. They allow you to wear your child until approximately 40 lbs in most cases (some more) and they offer a variety of carrying options. Most offer both a front carry (facing inward), a hip carry, and a back carry, but many now also offer a front carry facing outward. SSC carriers can usually hold babies from around 3 months up until they reach the height and weight limits of the carriers, but some have infant inserts you can purchase to use even earlier. 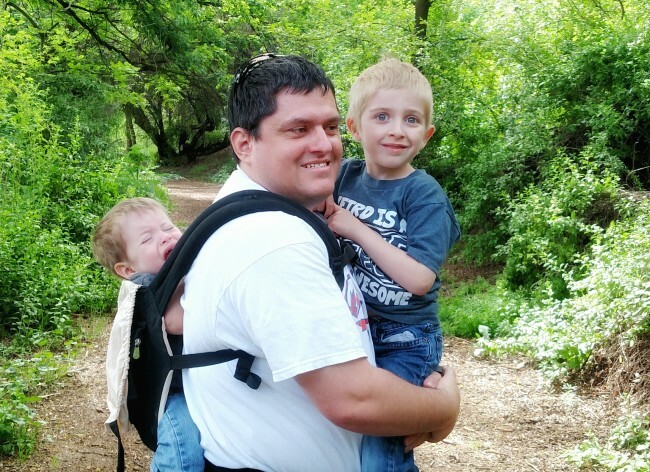 Our family personally uses Ergo baby carriers. We have both the original Ergo Baby carrier and the Performance Ergo Baby Carrier (also called the Cool Air Mesh 3 Position Carrier). Other great SSC carriers include Tula, Beco, and more. If you are shopping for a SSC, you may want to visit a local baby wearing group and try out different carriers in person before purchasing. We baby wear the most when we are on vacation now days. 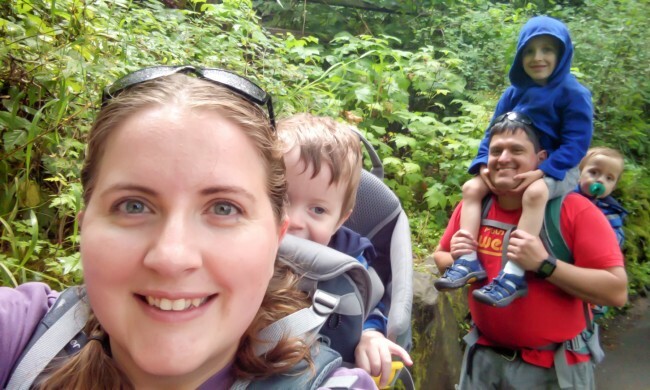 I still wear my babies at the store, and we do go on lots of little hikes that we baby wear on, but we definitely use our different carriers the most on vacation. So which carriers work best for vacation? Sadly, there is no one size fits all answer to this question, but I am going to share my 3 favorite carriers to take on vacation, and which ones I take on what vacation. I am also going to give you some points to consider when choosing which carrier is right for you and your child on your vacation. If you are traveling with a newborn, I adore a ringsling. They are easy to take with you, and they keep baby nice and close right on your chest. When we went to Disneyland when the twins were 3 months old, my Maya Wrap Ring Sling was my go to carrier. I wore one of the twins almost the entire time, and I could easily shade them with the tail. The Maya Wrap Ring Sling also had a pocket in the tail that I could put a pacifier, or diaper and package of wipes in. It was super conveinent, and if I needed to take the baby out of the ring sling, it wasn’t a hassle to either keep the sling on, or even just carry it with me. Price. A good SSC runs around $150 unless you find it on sale. A good structured back pack carrier can run $250 or more, plus you may need to buy extra accessories on some models (like a sun shade/rain hood). Weight limits. It is important to follow the weight limits on your carriers. Some SSCs can carry 40 pound children or more. Many Structured carriers are limited to 30 pounds for the child, 40 pounds total. If you have tiny kids like us, this may not be a huge factor, but it is something to look at. 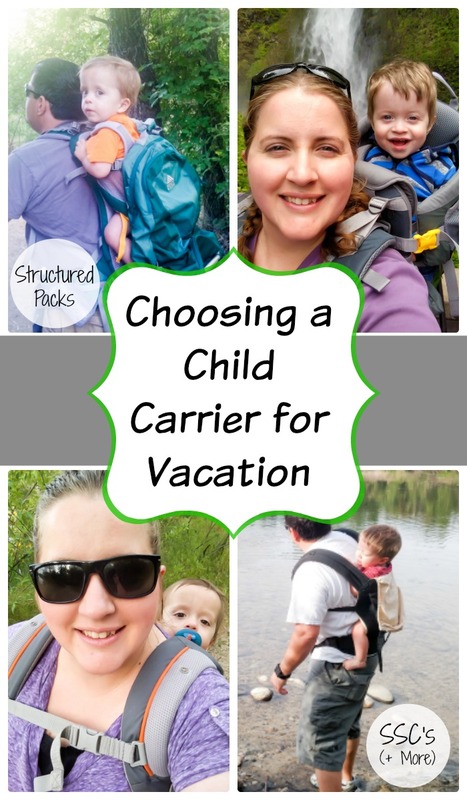 If you are only going to choose one carrier for all of your vacation needs, I strongly suggest investing in a quality SSC such as an Ergo, Tula, or Beco. 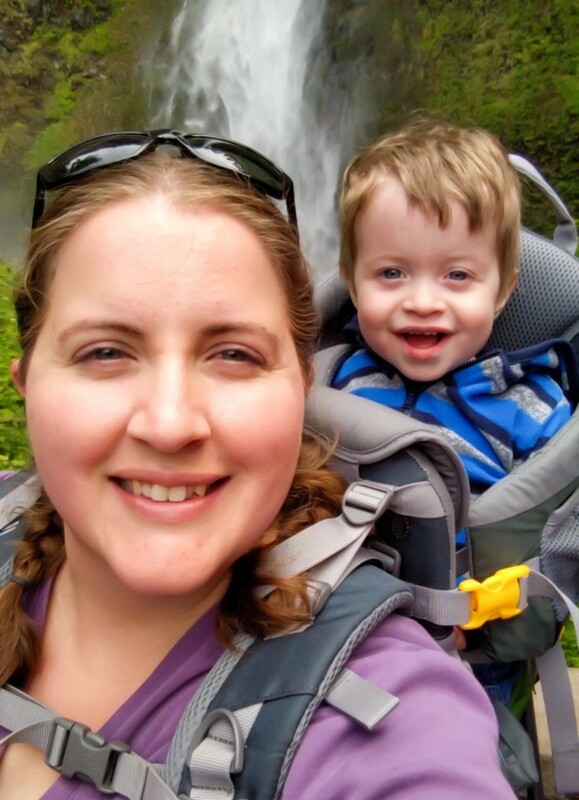 SSCs are great for hiking (though you may get quite hot with your little one against you) but can also be worn easily inside of amusement parks, grocery stores, or museums. They do not have a metal frame so they can easily be rolled up into your luggage. They also can be worn a variety of ways so they can last you from infancy to toddler hood. That said, I would never want to do a pure hiking trip with my Ergos. When we were planning for the Redwoods, we knew that we would need to take our structured carriers. For us, they are more comfortable, allow us to get the entire family in a picture easier, and they keep our twins the happiest. 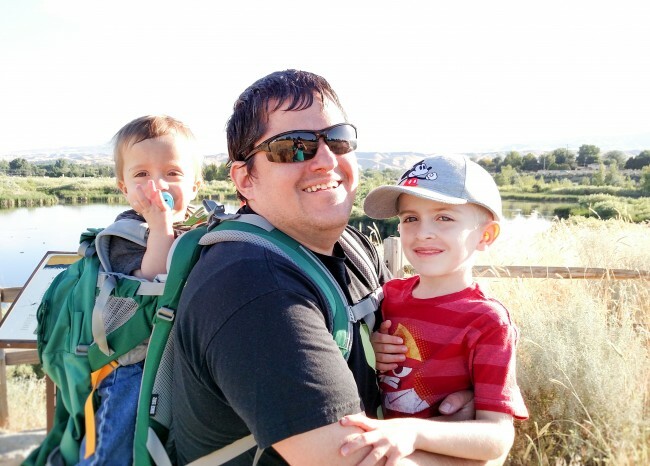 No matter what carrier you choose, I strongly suggest checking out your local baby wearing groups, or heading to REI to try out some different carriers in person before purchasing. Be sure to use your carriers regularly before using them on vacation. Just like you would make sure you are used to carrying a pack before a backpacking trip, you want to be used to your carrier before you rely on it on vacation. What carriers are your favorites to use on vacation? Let me know in the comments below! Should Your Child Miss School For Vacation?